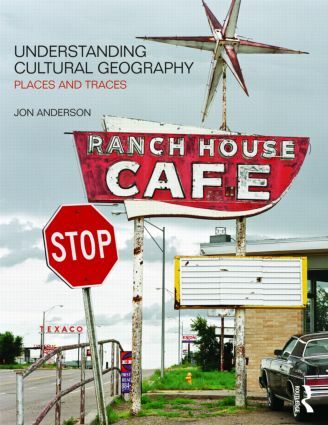 This new and comprehensive book offers a holistic introduction to cultural geography. It integrates the broad range of theories and practices of the discipline by arguing that the essential focus of cultural geography is place. The book builds an accessible and engaging configuration of this important concept through arguing that place should be understood as an ongoing composition of traces. The book presents specific chapters outlining the history of cultural geography, before and beyond representation, as well as the methods and techniques of doing cultural geography. It investigates the places and traces of corporate capitalism, nationalism, ethnicity, youth culture and the place of the body. Throughout these chapters case study examples will be used to illustrate how these places are taken and made by particular cultures, examples include the Freedom Tower in New York City, the Berlin Wall, the Gaza Strip, Banksy graffiti, and anti-capitalist protest movements. The book discusses the role of power in cultural place-making, as well as the ethical dimensions of doing cultural geography. Understanding Cultural Geography: Places and Traces offers a broad-based overview of cultural geography, ideal for students being introduced to the discipline through either undergraduate or postgraduate degree courses. The book outlines how the theoretical ideas, empirical foci and methodological techniques of cultural geography illuminate and make sense of the places we inhabit and contribute to. This is a timely synthesis that aims to incorporate a vast knowledge foundation and by doing so it will also prove invaluable for lecturers and academics alike.